Lot Size: 24376 sq. m.
This magnificent estate home sitting on 6 acres of beautiful property is a wonderful option for a luxury lifestyle in Boquete, Panama. The house is an architectural marvel that rivals the property. It’s subdued modern style emphasizes clean lines, brightness, lots of space and enjoyment of the amazing tropical mountain setting. The property hosts the main house as well as a caretaker’s or guest house near the entrance. The main ground level has the primary living areas including the master bedroom, large open floor plan great room with spacious living room and kitchen. Of special note are the enormous wall to ceiling windows in the great room. They look out on tropical plants, trees and the majestic mountains flanking Volcan Baru, Panama’s highest peak. The room encourages deep breathes and relaxation. It also invites you to visit the spacious, well-covered outdoor terraza. The terraza offers so much space for outdoor enjoyment warmed at night with a wisely located fireplace. The wraparound deck displays the 360 degree awesome views of this site. In one direction, enjoy bold and gracious mountains. In another, the path all the way through Boquete’s valley to the sea far below where the Pacific Ocean lies hinting and sparkling in the distance. From the outdoor deck, easily slide into the inset jacuzzi style hot tub, a sublime site for deep enjoyment of the year-round spring-like weather. There is a full bath on the deck to simplify bathing pleasures. There is also a room ready plus wired for a sauna installation if desired. Back inside, the kitchen is an epitome of modern style with pretty hues and upscale cabinetry. There is a pantry for extra storage and the laundry room is also here, therefore easily accessible. On this same ground floor level is the big master bedroom suite with lots of windows to carry forward the bright theme. A fireplace adds to the comfort and beauty. The master bath has a fun bathtub next to big windows and a broad double-sink setup. Large built-in closets cabinets provide so much storage space. Upstairs are three generous bedrooms with three full en suite bathrooms. The main house therefore has four total bedrooms. There are five and a half bathrooms in the main house. The guest house is one bedroom one bath. The house has three unique terraces to further provide access to the outdoors from many rooms. The basement is unusually big providing a two car garage and storage area. There is ample space around the house to ensure privacy. Your own Coffee too! There are recently planted coffee plants growing well on the property. They will begin to produce coffee beans for harvesting in 2020. Access to the property is on paved roads. It is about a 10-12 minute drive into downtown Boquete from this elevated location. This house is located close to impressive Finca Lerida just up the road. Finca Lerida has a hotel and wonderful cafe with fine dining level gourmet dishes in a lovely setting. 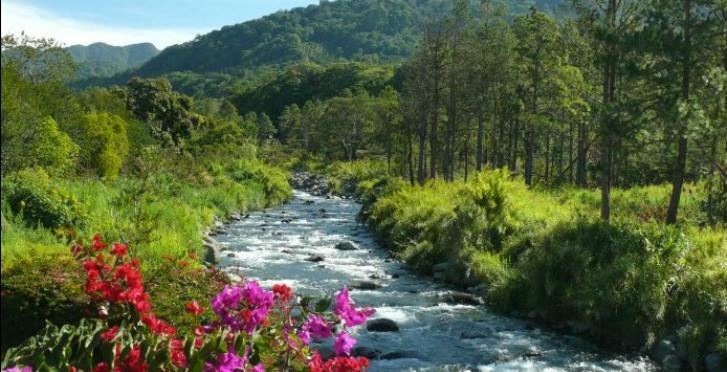 Further down the road you come to some of Boquete’s best trails including the Pipeline trail with towering waterfalls and famous Quetzal trail that goes all the way to Volcan on the other side of the mountains. The main house is approximately 6,225 square feet (578 square meters). The guest / caretaker’s approximately 750 square feet (69 square meters). This is a magnificent estate home and property!